We’ve all heard the phrase, “If everyone is special then nobody is special.” There’s a lot of truth to that. Not every movie becomes a blockbuster hit. Not every song tops the charts. But there are a few that seem to grab our collective imagination and pull us in. Things that are special to us demand our attention, and we willingly give it. 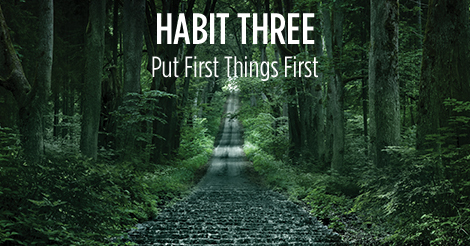 Habit Three: Put First Things First, is the key to our greatest accomplishments as humans. As a species, we’ve developed ways to produce more food with fewer resources, we’ve nearly eradicated many childhood diseases, we’ve developed vaccines, and created machines that allow us to travel farther and do more in less time. But we still have limits. We cannot be effective if our attention is too divided. We must prioritize the things that matter most to us so that we can devote our time and energy toward our most cherished people, goals, and ideals. We all need direction, but how do we best direct our energy? Consider this: Every child is special, but not every child is one of your children. Your own children will always hold a higher position on your priority list. You may truly want to devote more time to disadvantaged youth, for example, but you’ll only do that after you’ve given quality time to your own family. Both choices are good, but one carries more weight. Take the time to write the things that matter most to you in your planner. If you are struggling to define what is most important, try the I-beam test. Open your planner to an empty notes page and list everything you care deeply about—your talents, knowledge, skill set, family members, friends, hobbies, income…all of it. Take your time and make sure you have a complete list. Now imagine you are standing at the edge of a huge ravine and everything on your list is on the other side. In order to get any one item on your list, you need to cross a 200-foot steel I-beam spanning the gulf. Read over the list you wrote in your planner and ask what you’d be willing to cross the I-beam to save. Some things aren’t worth the risk, but there are other things you’d cross the I-beam for without hesitation. Those are the things that are rooted in your core values—they matter most to you. If your daily tasks are centered on items from that list, you’ll find that it’s easy to make time for them. The beauty of Habit Three is that you determine what matters. You decide how you will spend your time. You take ownership of your actions. And by making those decisions daily, you will move toward your goals and become who and what you truly hope to be. None of us is able to work only on our top priorities, but with just a few minutes of daily planning, we can be sure that our top priorities get our attention first. During your daily planning sessions, write all of the tasks that you’d like to complete in the day. Once your list is written, prioritize your tasks (A, B, C). Remember that there is a difference between vital and urgent. There are a lot of things that seem urgent, but they aren’t vital. Analyze your vital tasks and number them in the order that you intend to complete them A1, A2, A3, etc. Do the same with your B and C tasks. If you start your day working on A1, you’ll be sure that your most important tasks are being addressed first each day—first things first. Certainly, emergencies will arise, life challenges will alter your direction, but you are adaptable. Your goals can change. If you keep your actions grounded in your governing values, you can find peace and satisfaction in your daily accomplishments, whatever your situation. Once you’ve determined the best things that you can do in your individual situation, set meaningful goals to help ensure that you do those things. Break your goals down to manageable tasks and schedule those tasks into your daily plans. Then go for it! In just a matter of weeks, you’ll surprise yourself with the things you’ve been able to do. Been a working mom decreasingly for the past 28 years and also a Franklin (Covey) planner daily user for almost that long. When I began I did all of your cassette tapes and embraced daily planning and it has helped me succeed with most of what matters most to me. Now, others make fun of my planner but at the same time some are impressed with my “old school” planner and ideas. I really wish there were a way to get the word out to others that this works but I do feel I am a living example. Thank you! I appreciate these reminders of Covey’s teachings. So simple and direct, but I needed this course correction. Thanks for continuing the good work. Great words of advice. I am totally overwhelmed, so as soon as I have a moment, I will relist everything with the three priorities.